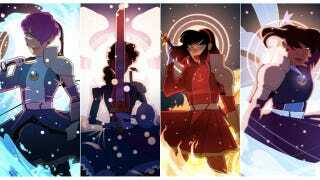 While it's set firmly in the magical girl genre, Mildred Louis' webcomic Agents of the Realm is more than your typical manga-inspired comic. The five heroines who meet in college won't just have to battle monsters; they'll also have to deal with the real—and sometimes violent—aspects of mundane life. Norah Tanner is having a weird first few days of college. Not ready to move too far from home, she's attending Silvermount University, but she's living in the dorms. However, her roommate hasn't shown up. She's somehow managed to get on her mythology professor's bad side during attendance in the very first class. And, oh right, she has become a monster-fighting magical girl. After discovering a gaudy brooch, Norah has become an "Agent" of her world, and suddenly she's involved in a battle that spans dimensions. But Louis warns that the comic will tackle some heavy (and potentially triggering) issues like alcoholism, domestic abuse, and self-harm. And as we spy on Norah while her parents worry over her during a video chat and stay closely guarded even as she finally makes a new friend, it becomes clear that the comic's most intriguing mysteries aren't the fantastical ones, but the realistic ones lurking in the background.